Carports solve all of your outside storage space and Garage kit needs. Long gone are the days of hiring expensive contractors. Today, anyone can have steel carports or garage kit to park their car, store their tools and even house their livestock within a few hours! Our award winning buildings do the job. At CPM, you can have convenience and portability all in one at a great price and without the hassles of hiring unknown builders. Carports and more, California based and the nations largest independent dealer of all you'll need for your prefabricated garage building kits and carport canopy needs, is located in gorgeous Northern California. Whether you need kits, utility storage sheds, metal garages or livestock shelters, CPM has it all! Carports aren't as much of a task or as expensive as you might think. Prefabricated Garage Kits not only shelter vehicles, and steel carport kits can also save you time. With car ports, you can protect your car from all kinds of elements including snow, ice and hail. Your cover also protects from all bird excrement that can eat away at the finish, and you won't have to spend time scraping ice or brushing snow during the winter months. The convenience of portable carport covers will help maintain the value of your car and make life easier. You should consider what's going in your portable metal garage kits or carport. Most likely you want to protect something that you've spent time and energy earning money for, so you want to make the right choice. Many people successfully use prefabricated garage kits as boat covers or car ports. You invested money in your boat, so it makes sense you want to protect it! Garages or metal building kits can also be used as RV carport covers for extra protection. If you think you can't find affordable Prefabricated Garage Kits that is large enough to protect your RV, think again! Did you know that you have many different kinds of carport kits and Canopies to choose from? You can get carport kits in many different colors. If you desire, you can even customize your building with fancy covers. In fact, some people buy carport canopies that match the color of the car it will be housing! A canopy style cover is perfect for anyone who doesn't like to tackle complicated projects with all kinds of directions to follow and little nuts and bolts that need to be affixed everywhere. Canopy covers can be very easy to put together. 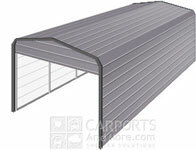 Thinking about steel carports or metal garage kits for your property? Our are made out of steel and are very economical when compared to hiring a contractor to build one from scratch. Steel carports arent lightweight, so don't be fooled into thinking that they can't do a good job protecting your valuables. They are very durable and easy to put together. Steel garage kits are able to stand firm against all kinds of weather conditions. You can find the right size no matter how many vehicles you wish to protect. Steel garage kits offer peace of mind and outstanding protection. Prefabricated Garage Kits can offer you more flexibility if that's what you are looking for. It is important for some people to make sure that any additional buildings on their property are similar to or match the design of their home. You can get all kinds of portable aluminum garage kits like or aluminum carports that are able to be formed in such a way as to work with the current architectural scheme on your property. Portable shelters come in more options than just portable garage kits. Sometimes the sizes of most are just too big for personal storage shed needs. In that case, you might need portable buildings like storage sheds. Buying units that are portable and easy to assemble is much safer and more economical than trying to build your own using free shed blueprints, especially if you aren't an experienced builder. Storage buildings come in a variety of sizes and colors to choose from. If you are looking for a sturdy instant shelter, you might want to consider metal sheds. Another portable shed option is to get one with a steel frame and a polyethylene cover that's treated to be able to withstand the elements. You may need canopies or agricultural steel buildings. Portable livestock shelters allow you to offer protection to many animals from horses to dogs. Depending on your area, you may want to protect more than just your animals, you might need to look at car ports or greenhouse buildings. Greenhouse kits can not only protect your plants, but they can also help prolong your growing and harvesting season. Finally, you might simply be looking for a Prefabricated Garage Kit or car port that will provide shelter and shade when you entertain. People with large families, who entertain frequently or simply enjoy spending time outdoors without having to build a permanent outbuilding love the flexibility a car port shade canopy offers them. Car port kits are easy to assemble and can be put up and taken down! For the creative we can provide engineered cad drawings you could use on a 3d printer to make a prototype. You have limitless possibilities at great prices for all of your outside car port storage needs. From utility carports to portable carports and all other kinds of outdoor shelter needs, CPM has options for everyone. Our Carports for sale in northern & southern California are backed by exceptional quality. The northern California steel car ports are backed with live support at our toll free #1-877-275-7048. Even though we are located in Sacramento and proudly provide metal car port kits to the outlying areas as well as the entire U.S.A. There is a price difference between states when it comes to building and you better believe that we will try to beat any advertised price you may come across if its built the same.